Vanilla flavoured shortcake biscuits enrobed with Belgian milk chocolate with copper and silver lustre. These indulgent vanilla shortcake biscuits are smothered in rich, Belgian milk chocolate. 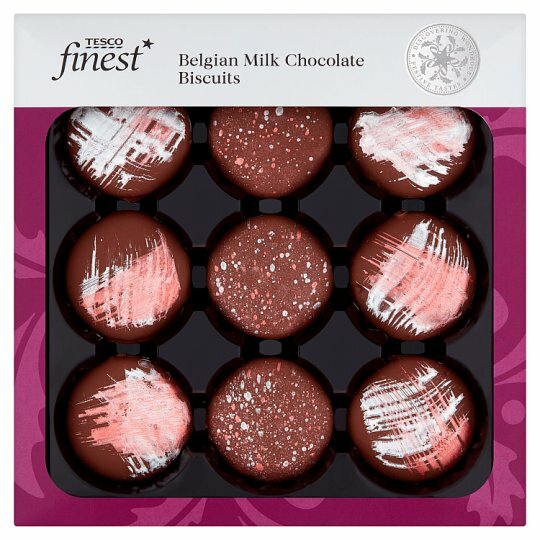 They're decorated by hand with a festive sparkle for an irresistible Christmas treat. INGREDIENTS: Belgian Milk Chocolate (59%) [Sugar, Cocoa Butter, Dried Whole Milk, Cocoa Mass, Emulsifier (Soya Lecithins), Flavouring], Wheat Flour [Wheat Flour, Calcium Carbonate, Iron, Niacin, Thiamin], Palm Oil, Sugar, Glucose Syrup, Rapeseed Oil, Raising Agents (Sodium Bicarbonate, Ammonium Bicarbonate), Salt, Colours (Iron Oxide, Titanium Dioxide), Flavouring.